Avalid credit card is required to secure your reservation. Full non-refundablepayment will be charged upon booking confirmation. Strictly no refund forcancellation/modification/no show or shorten stay. Please read the following terms and conditions before proceeding with the reservation. By proceeding with the reservation, you further agree and acknowledge that if the reservation is accepted by the property, your stay subsequently shall be subject to our standard terms and conditions. * You must be at least 18 years of age to check-in and reserve for a room. * A valid credit card is required to secure your reservation.Full non-refundable payment will be charged upon booking confirmation. Strictly no refund for cancellation/modification/no show or shorten stay. * Payment by Visa or Master only. * In the event guest completes a booking based on a rate that has been incorrectly posted, we reserve the right to correct the rate or cancel the reservation at our discretion. * We do not accommodate children below 2 years old. Children who are from 2 to 12 years old must stay in private rooms accompanied by adults and separate beds must book for them. They are not allowed to stay in dormitory. * Extra bed is not allowed in all room types. * All requests are subject to availability upon check in. * Room/Beds allocation are subjected to availability and at property’s discretion. * Check-in time is from 3:00 pm and check-out time is by 11:00 am. * Self-check-in kiosks are available. A valid passport is required for using the kiosks. * Early check-in and late checkout are not allowed. For check-out that are not on time. We reserve the right to impose a penalty charge and remove all personal items of the guest who does not show upon time. * We do not provide luggage storage service and do not receive items on behalf of guests. * Guests will be subjected to $10 penalty charge for every key card lost / damaged. *No gatherings and parties of any nature are allowed on our premises.We reserve the right to evict unauthorized visitors. *We reserve the right to charge guests the cost of rectifying damage or soiling, caused by accidental, deliberate, negligent or reckless act of the guest to our property or structure. *The property may, at its absolute discretion, cancel the reservation ifthe property is in the opinion that the reservation information provided isfalsified or incomplete. *Visitors are not allowed into the rooms. *T​o ensure all guests enjoy the comfort and safety of the facilities we offer, the we uphold a strict zero tolerance policy towards commotion, excessive noise and parties. * Please treat our staff with respect, any guests caught with inappropriate conduct or behavior, after the allegations have been investigated, the property reserves the right to take action against the guest which may result in, but not limited to, being asked to leave without a refund for any services incurred or might be handed over to the relevant authorities. * Smoking is strictly prohibited on the premises. A SGD 500 fine will be charged to any guest who violates the smoking policy and in addition, the violated guests’ details will be submitted to the relevant authorities. * The property shall not be liable for any losses, damages,costs or expenses incurred by you as a result of any cancellation of the reservation by the property. * Guests are responsible to take good care of their personal belongings and valuables. The Management will not be responsible for any loss of items during your stay with us. Part of The Uncharted Co., 5footway.inn is the biggest hostel chain in Singapore with properties located in the heritage-rich Chinatown, Boat Quay and Kampong Glam vicinity. 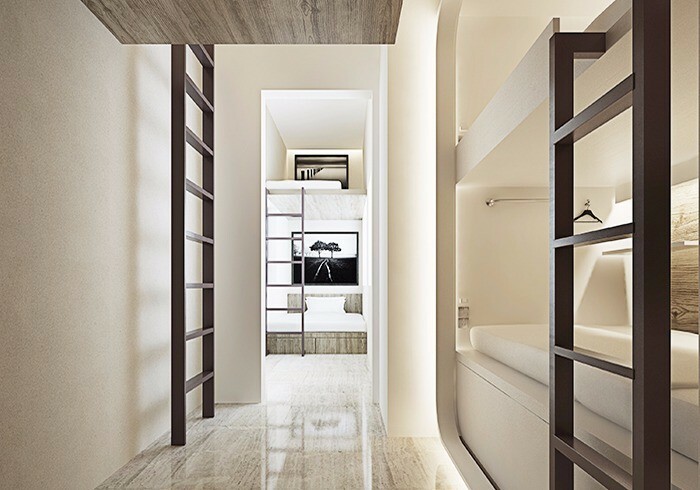 Redefining the meaning of “hostel”, Project Ann Siang is a premium boutique hostel which combines functionality with style. Located along South Bridge Road in Chinatown, 5footway.inn Project Ann Siang is a modern hostel offering dormitory and private rooms with free WiFi. Guests have access to a 24-hour laundry facilities. 5footway.inn Project Ann Siang is a 2-minute walk to Buddha Tooth Relic Temple and Museum and the bars and restaurant at Club Street and Ann Siang Hill. Located between Telok Ayer and Chinatown MRT Stations, the hostel is 300 metres from Sri Mariamman Temple. Changi Airport is 17 km away. All rooms are air-conditioned and offer shared bathroom access. Select private rooms have an en suite bathroom. Other facilities include a shared lounge and a terrace. The upgrading of our Project Ann Siang is recently completed. The refreshed property creates a space of nostalgia and sets off imagination in city living.